Interested in Minerals, Gems & Jewelry? You're just right. Lucky Stones is the 1st choice to buy minerals, gems, semi precious stones and tumbled stones in Chiang Mai. We not only offer the biggest selection of gemstones, opals and silver jewelry in town, we also offer it to the best price: Most of our customers are stone dealers, who sell our stones allover in Southeast Asia, Europe, Australia, China, Japan and America. We do both wholesale and retail, so no matter whether you want to buy 1 opal or 100 you will be delighted to look through our huge collection. We offer minerals and stones from 48 countries - and most important: We only offer real stones - fake, synthetics or plastic are out of question. Unfortunately it happens too often in Asia. Lucky Stones was established in 2012 by Laurenzana family. So we are a family business and each of us is dedicated to minerals, gems and silver jewelry and sees it as a passion. A passion that comes with over 30 years of experience. We sell Minerals, Gems, semi precious stones and Opal. Furthermore you can find tumbled stones or silver jewelry. Our silver jewelry uses exceptional stones and is made in our own design. 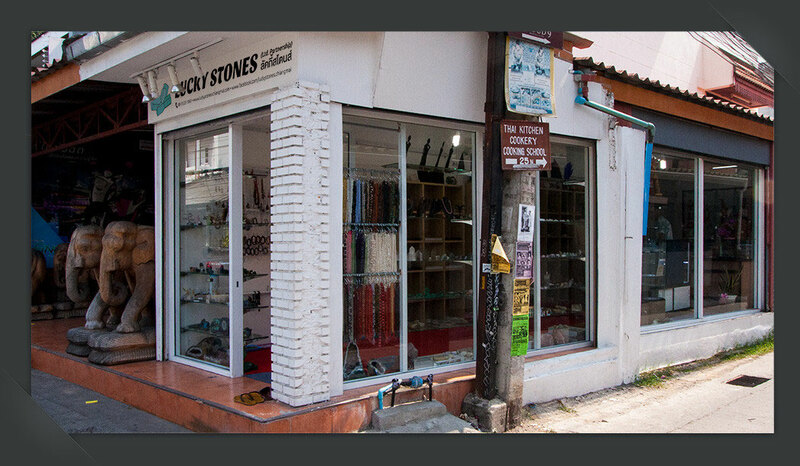 Lucky Stones, Chiang Mai sells unusual stones, extraordinary stones and specimen from all over the world. Our shop has big collection and the biggest selection in Chiang Mai. Ask your customers, they will agree that we have not only the best prizes in Chiang Mai, but also the best prices in Thailand! We sell cheap gemstones, but all of them are real stones! New location of our shop! Now Loi Kroh Rd. Soi 1 next to Number 1 Bar. If you have any questions, please do not hesitate to contact Wiphaphorn Laurenzana!